Using an online legal service like Swyft Filings is a reliable way to form an LLC, and it’s much less expensive than hiring a lawyer. 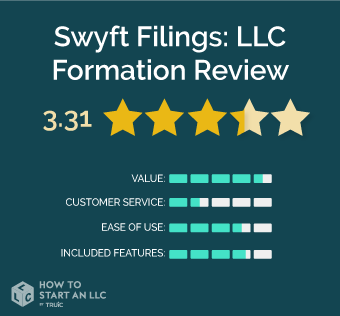 In this review, we’ll go over the details of Swyft Filings' LLC formation service and explain how it compares to other services on the market. Read on to find out if Swyft Filings is the right choice for you. Swyft Filings is among the most affordable options for forming your LLC. In addition, Swyft Filings provides added value by including special offers and discounts through their partners. Go with Swyft Filings for a solid balance between pricing and the features you get. Who is Swyft Filings Right For? Swyft Filings is a newer LLC service that offers a free accounting consultation and resources at a low price. They let new business owners hit the ground running without paying too much. Our recommended alternative to Swyft Filings is Northwest. They provide great value and customer service, you can read our full review here. Like most other LLC formation providers, Swyft Filings offers a tiered pricing model. Overall, Swyft Filings' packages are competitively priced, with transparent and honest fee structures. We especially appreciate that Swyft Filings does not mark up state filing fees, a practice that is all-too-common in the industry. The lowest cost package (“basic”) gets your LLC formed. At the middle tier (“standard”), Swyft Filings will also register an EIN for your LLC and prepare an operating agreement. The standout feature of Swyft Filings’ premium package is a customized website for your new business. At all pricing levels, Swyft Filings lets you add stand-alone features for an additional fee. Important: Swyft Filings’ registered agent service does not come included with any service package. This service will cost you $149 extra across the board (charged per year). There are a few exciting features to keep your eye on though. The free domain name and $200 bank bonus offer with Bank of America are valuable. These sort of deals are left out of basic packages that competitors sell. They also offer a free 30-minute business tax consultation to help you be prepared for when Uncle Sam shows up to collect. Who should purchase the Basic Package? 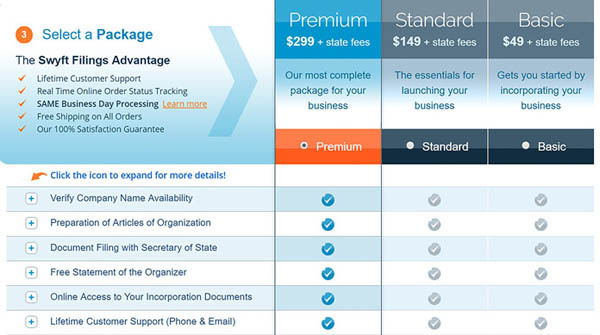 The Basic package offers a ton of value for business owners who are starting from scratch. If you can wait a week to form your LLC, the turnaround time is perfectly reasonable. Buy the Basic tier if you’re looking for a great balance between cost and the value of features included with your LLC formation. Who should purchase the Standard Package? If you’re looking to obtain the absolute essentials for your LLC formation - plus a few bells and whistles - the Standard will have what you need at a fair value. This is even truer if you plan on serving as your own Registered Agent, which will save you some money. Includes digital seal graphic (not the metal seal stamp), 20 stock certificates, and an Ownership Ledger with your company name printed on it. The Ownership Ledger helps keep track of shareholders. Note: it isn’t stated in the pricing table which service provider is actually offering this perk. This makes it difficult to verify the value of the offer to make an informed decision. Who should purchase the Premium Package? If you already have a plan for managing your online presence, this is where the Premium package shines. You might also opt for this plan if you’re under a time crunch to form your LLC. We really liked how Swyft Filings presented partner offers to help you save on related expenses, depending on your business needs. This was a creative way to add value to service offerings without having to raise the prices. You can obtain all of your basic LLC formation needs with the Standard package, which is also reasonably priced. There was some inconsistent information given between the chat and phone agents we got in touch with. The phone agent was able to help us get what we wanted, while the chat agent seemed ready to end the conversation at any moment. We were able to get in touch with a chat agent almost immediately, but waited around 5 minutes on hold to get in touch with a phone representative. It has been determined by the Better Business Bureau (BBB) that Swyftfilings fell short of meeting customer expectations in several key areas. Accordingly, Swyftfiling has lost its BBB accreditation until its business practices have been corrected and reevaluated. This review has been updated to reflect user reports as such. Swyft Filings really shines through its user dashboard that new customers gain access to. All of the resources - such as your filing status or compliance alerts - are streamlined in a user-friendly format. The same thing cannot be said about its ordering and checkout experience. It took more than 12 pages to accomplish our goal of completing the order and beginning the LLC formation process. Swyft Filings provides a customer-focused service offering. Most customers will find exactly what they need - and then some - with the Basic and Standard packages. The main benefits of the Premium tier are the free web hosting and quick order turnaround time. Each package is reasonably priced and offers thoughtful benefits for first-time business owners.